I hate GMOs and therefore I loathe high fructose corn syrup. I'm the crunchy Mom who knows all too well what pop can do to your body so I absolutely do not allow soda consumption in my house. Lucky for me Dexter doesn't ask for it so I have gotten off fairly easy. 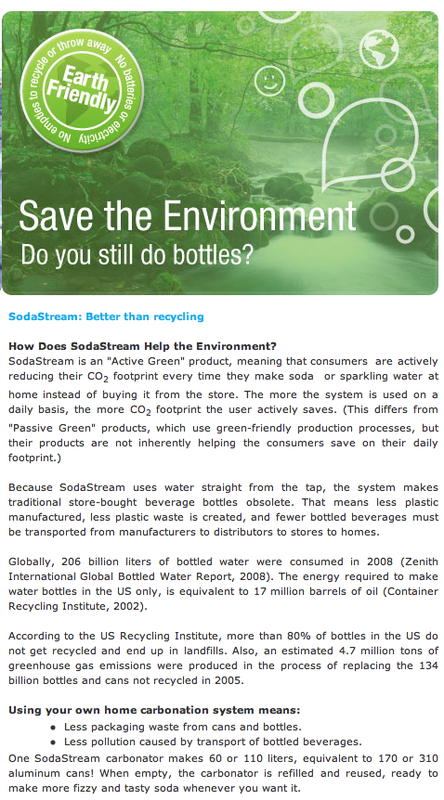 Another quality that I love about SodaStream, other than the ability to make your own soda, is their green initiatives! Talk about WOOT WOOT! When I know that a company goes the extra mile to be committed to the environment, you bet I am going to support them and tell every one about it! Kuddos SodaStream! Not only do you pass the test but you set the bar awfully high! So now you can have your pop and drink it too! I don't think I would use this to make "Coke". I could definitely see using it to make fruit flavored sparkling waters though. My husband and daughter would love it! I think this would be fun to try! Maybe someday we'll get one. I am with you on GMOs, and I love the idea of anything that will help me eliminate them while still enjoying the foods and beverages we like.